Stanford senior midfielder JJ Koval was selected ninth in the MLS SuperDraft by the San Jose Earthquakes on Thursday morning, marking the second time in as many years the South Bay squad has added a Cardinal player. 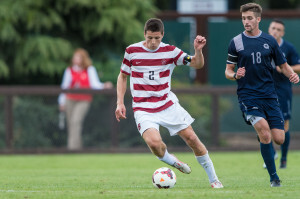 Koval will join former teammate Adam Jahn ’13, who was picked 15th by the Earthquakes in last year’s supplemental draft. Jahn scored four goals in 16 appearances in his first MLS season, including the dramatic equalizer in the 92nd minute against Portland and another late game-tying goal against New York. Koval isn’t as much of a scorer as Jahn — he notched just two goals and an assist last season — but the Cardinal captain was prized by pro scouts for his physicality and leadership. The All-Pac-12 midfielder played fewer than 90 minutes only twice last season, and notched a crucial assist on Aaron Kovar’s overtime goal to beat No. 5 Cal in the final game of the regular season. That win helped propel Stanford to its first NCAA Tournament since 2009. In October, Koval told The Daily that he was on track to graduate with a degree in Human Biology during fall quarter, but that he hoped to return to school some day to finish his pre-med classes. In an interview with topdrawersoccer.com two weeks ago, Koval noted that he grew up rooting for the L.A. Galaxy, the Earthquakes’ rival.